SBURY PARK - Take the popularity of the Frozen Disney movie, and add inspirational stories of those in the computer science field, and you could inspire more children to take an interest in learning code. 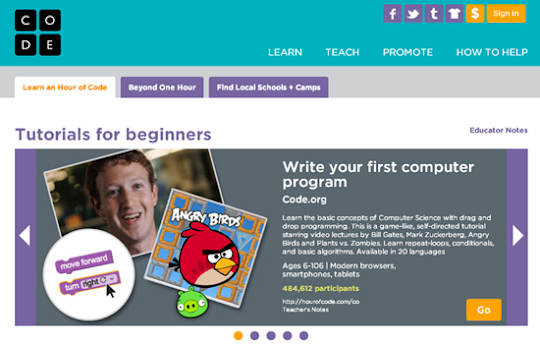 That's the theme of this year's Hour of Code, a free afternoon event that gave children a look into a field that organizers said not only helps develop problem-solving and creativity but is also an in-demand job skill. "It's becoming a necessity," said Bret Morgan, founder of Cowerks, the host of the event. "Even if you had no intention of pursuing it, you should at least have an exposure to the language of programming. It's part of being a well-rounded individual. Just as you might learn a foreign language or read the classics, but because it is so accessible and in such widespread use, you'd find code helps in all sorts of job fields." The one-hour introduction to code - an event put together by Cowerks, Jersey Shore Tech and Lakehouse Music Academy - at the Cowerks suite in Asbury Park, is part of a larger initiative to demystify computer programming and encourage its pursuit at an early age. Code Week, through December 14, had 60,000 events worldwide. The initiative, through Code.org, aims to give "every student in every school the opportunity to learn computer science and believe computer science and computer programming should be part of the core curriculum," according to the Code.org website. Computer science fits alongside other science, technology, engineering, and mathematics (STEM) courses like biology, physics, chemistry and algebra, organizers said. However, in New Jersey the classes do not count toward curriculum requirements, said Sean T. Walsh, chief executive officer of Crowd Communications Group, who helped set up the event. "There's no core requirements for New Jersey. So if we can get them energized at a young age, then come 10 years when they are looking at entering a field they have these basic skills that are increasingly in demand," Walsh said. By using the characters from Disney's Frozen in the programming lesson, students get an element of fun to what may be the assumed complicated world of code. That's not the case, organizers said. Code can be learned quickly, and the introduction to code basics can be the building block toward more elaborate projects. "By adding these fun elements, you can get kids really excited about all types of projects. They can see how they can program robots and other fun things, by using skills that start here," Walsh said. The project during Hour of Code had students creating snowflakes and ice crystals through programming. Elsa and Ana guided students ages four through 13 through the lesson. Presenter Nina Saporta, a computer engineer, spoke of how code is not necessarily just a pursuit for the math-inclined. "Here's an art project I created through code," Saporta said. "Through programming I can change the colors and shapes, and I figured that speaks to younger children who are also first learning shapes and colors." Saporta brought her daughter, Audrey, who at age 3 was the youngest participant in the hour of code. She said that she also hopes to serve as a role model for her daughter, and encouraging computer engineering as something more girls should pursue. "They can do this at a young age; you would be surprised by what they understand," Saporta said. "When you are encouraged and exposed to this young, it feels natural, that engineering way of thinking." Morgan said the average age was seven years old, among the 30+ attendees of the event. With a long waiting list to participate, Cowerks will likely hold more events of this type next month.